This is unbelievable. We commonly see these vehicles on the weekends around our state. These people come up over the border, pick up their items at garage sales, then take them across the border again, and resell them. They generally use small pick-ups with some kind of rack rigged to them. They are usually packed at least twice as tall as their vehicles, and sway dangerously down the freeway. 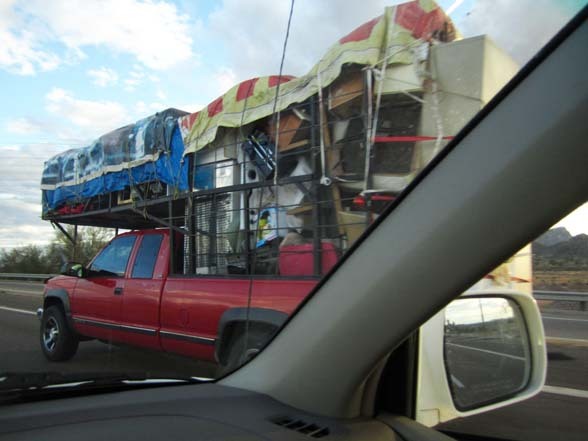 I laugh about the creative packing, but I wish more of them would be pulled over for having unsafe loads. We saw this one yesterday, while traveling home from California. The photo doesn't do it quite enough justice, and this truck was one of the most dangerously-loaded vehicles I've ever seen. Holy Crap! I would hate to be travelling beside this vehicle, especially on a windy day.